We have a bit of a love affair with the humble pom pom. Plush, bouncy, and playful, the pom pom is a yarny symbol of happiness. I dare you to try not to smile while holding one. Impossible. They make whimsical additions to knits, finish off a gift with a flourish, or make flouncy cat toys. We also like to hang them wherever we can at the shop (have you seen our awning lately?). Did I mention you can make them using leftover yarn to bust stash like a boss? 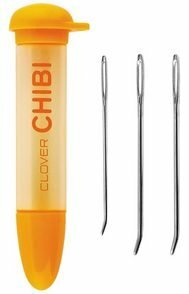 Our favorite method (and we’ve tried quite a few) is using these funny little gadgets by Clover (available at Stash, of course). They are a little tricky looking at first, but after your first go at pom pom making, you’ll be a pro. Use a lot of yarn. The more densly you wrap each arm of the pom pom maker, the more plump your pom will be. Have fun with it! Hold multiple colors/textures of yarn together. Wrap each side in a different color. See what happens! Triple tie the center so it’s nice and tight. You don’t want your pom to start shedding its fringe at an awkward moment. Now it’s your turn! What you’re favorite way to use a pom pom? We love festooning the shop with festive decor this time of year, and are always looking for fun ways to incorporate yarn into our decor. My favorite new project has to be these wee yarn-wrapped trees. All it took was a quick trip to the craft store and a search through the leftovers bin for some green yarn. In a few minutes we had these delightful trees. And because I love a bit of sparkle (and an excuse to get out the glue gun), we added sequins in Stash colors. 50 yards medium-weight yarn (quantity may be more or less depending on the size of your cone). We chose green but think a snowy white would be lovely. Glue; we used a glue gun, but Tacky glue would work well too. Beads, sparkles, sequins, Pom poms; anything goes when it comes to embellishing your tree. Add a small dot of glue at the top of the cone to secure the end of your yarn. Begin wrapping the yarn around the cone, beginning at the top and working your way down while making a single layer of yarn. Continue until you get to the base of the cone. Add another small dot of glue at the bottom and wrap yarn over it. Carry the yarn to the inside of the cone and secure with more glue or a piece of tape. Cut. Decorate your wee tree with glee! Have you made any holiday decor for your home or workspace? Share a picture with us on Facebook! I feel like I’ve thrown a LOT of information at you over the course of the blog series thus far so I’m hoping this post won’t be quite as overwhelming as the rest and hopefully not as wordy! There are a few little things about knitting sleeves that I wanted to mention and didn’t want the information to get lost in some of the longer posts about modifying sweaters. Real sweater WIP complete with little holes under the arm. There are a couple of ways you can deal with this. The first being to leave a decent sized yarn tail when you pick up your stitches and use the tail to close up the holes. The other thing you can do is pick up a couple of extra stitches and then get rid of them on the next round by using K2TOG (knit two together). You can even knit those stitches together through the back loop to tighten them up a bit more. Modifying Shaping: We talked about this a bit in our previous post, and I just want to reiterate that you’ll be much happier with your finished sweater if you take the time to shape your sweaters to fit your body. If you’ll be shortening the sleeves or lengthening them, you’ll want to think about if you want to put your decreases (or increases if you’re knitting bottom up!) closer or father apart. Don’t be afraid to change the sleeve length of the pattern! If you prefer 3/4 length sleeves…go for it! Want to change a short-sleeved or 3/4 length sleeve to full length? Add a couple of more decreases and keep knitting! Working in the Round: I’m going to be completely honest, here. I loathe knitting sleeves on double-pointed needles. This is the number one reason I taught myself Magic Loop (knitting in the round on one long circular needle). I highly recommend doing magic loop for sweater sleeves. I find that with dpns, you end up moving your entire sweater each time you reach the end of your needle. There are plenty of people out there who don’t mind using dpns for sleeves, so give it a try if you really love using dpns! If you’re interested in learning magic loop, we have a couple of great resources at the shop: The Magic Loop Booklet and the Circular Knitting Workshop book. Consider Knitting Your Sleeves Before Finishing the Body: Never in a million years would I have thought to do this for a top-down sweater, but it makes complete sense. Jasmin from The Knitmore Girls Podcast mentioned that this is how she knits her top-down sweaters, and I think it’s brilliant. Like I mentioned above, when you are knitting sleeves you are constantly rearranging/twisting your sweater. This method has you knitting the sleeves right after the sleeve split, so that instead of an entire sweater sitting on your lap you just have the top portion of the sweater. You might want to knit an inch or two of the body first to make sure that you’re on track with the fit just in case you need to rip back! I haven’t actually tried this yet…but I’m hoping to do it for my next top-down sweater to see if it helps my dislike of sleeve knitting. The only reason I can see NOT to do this would be if you are worried about running out of yarn. In that case, I’d knit the body first and split your remaining yarn in half using a kitchen scale so that your sleeves will be the same length. I think that’s all for sleeves! Next week we’ll have our final 2 posts in the series and then it will be time to start our sweaters!! The biggest appeal of seamless sweater patterns is that you can try them on as you go and make adjustments to fit your body. It’s a little more difficult to do with bottom-up sweaters, but it can certainly be done! Top-down sweaters are perfect for making adjustments as you go! I think one of the biggest things to keep in mind is that you don’t need to follow the pattern exactly. You’ll be much happier with your finished sweater if the smallest part of the waist lines up with your waist, the hem hits you in a flattering spot, and the sleeves are the correct length. 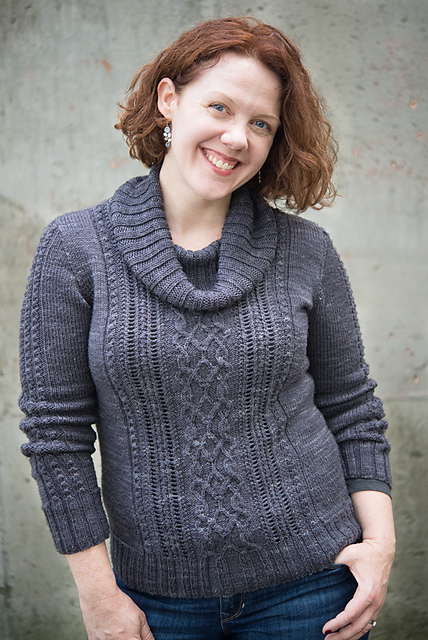 Let’s use the Bayside Pullover from Coastal Knits as an example. Below is the schematic from the pattern. We’ll start at the top of the sweater and work our way down. We’re not going to talk about every single measurement and change you can make to your sweater, but I’d like to hit the big ones: Yoke depth, sleeve circumference, chest, waist, and hem. Yoke Depth: As a fairly short person, I find that the yoke depth on many knitting patterns are a touch longer than I’d like. But some of you taller folks may find that it’s not quite long enough. Take a tape measure and start measuring from the top of your shoulder. Look at where the yoke depth as written will hit you. If you follow the directions, this is where the sleeves will be split off from your sweater. Does it reach where you’d like the underarm of your sweater to begin? Is it going to be saggy in the armpits if you knit that length? Figure out your ideal length. After you’ve done your raglan increases you can keep knitting without increasing until you reach this measurement. You can also “try on” your sweater to figure this part out. It’s a little tricky, but put your sweater on some waste yarn, drape it over your shoulders and pinch the sleeve stitches around your upper arm/shoulder. You can then decide if you’d like to make the yoke a bit longer or split for the sleeves. If you are knitting a cardigan, the front stitches won’t be connected and you might be adding a button band afterwards, so don’t freak out if you try on your cardigan without the button band and it seems too small! The stitch markers mark the raglan increases. There will always be 4, and you will be increasing on BOTH sides of the markers. This will result in a total of 8 stitches being increased during each raglan increase round. 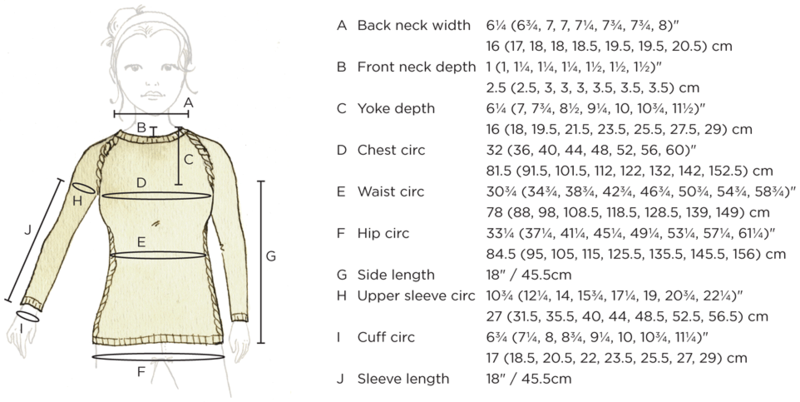 Chest Circumference: If you’ve decided that you’d like your sweater to be an in-between size for the chest measurements, you can either do more or less raglan increases to get your desired size. For example, if you wanted a sweater (using the Bayside Pullover from above) that measured 34″, you could follow the directions for the size 32″ and do a few extra sets of increases. Now, you probably want to know how many sets of increases. Well…the gauge for the pattern is 24 sts/4 inches which equals 6 sts/inch. Since you want TWO extra inches you’d want 12 extra stitches. You’ll be adding 4 body stitches during each increase round. See Diagram Above. So, to achieve 12 extra stitches you’ll want to do THREE extra raglan increases on the BODY ONLY. If you want your sweater to be a little bit SMALLER, just leave out an increase or two using your gauge to figure out how many increases to leave out. Arm Circumference: The idea of altering the circumference of the upper arms is exactly the same as the chest circumference. If you’d like them a bit larger than the schematic, add an extra increase or two on the SLEEVES ONLY (see diagram above for placement of these stitches) and if you want them smaller leave out an increase or two. Of course, this would be a bit more complicated if you were doing a pattern that had cables or lace and required a specific number of stitches. If you’d like your entire sweater (sleeves and body) larger/smaller, do more/less increases on both the body and sleeves. Waist: Ideally you want the smallest part of your sweater to match up with the smallest part of your waist. The best way to achieve this is to measure how far it is from just below your full bust to just before the smallest part of your waist. You’ll need to look at the pattern and decide if the pattern as written will work, or if you want to do your waist decreases closer together or farther apart. Instead of doing decreases every “X” number or rows (this will likely be how the pattern has the decreases written), take the measurement from above and divide it by the number of decreases the pattern calls for. This will tell you how often to do your decreases. Let’s say that you measure and get 6 inches and the pattern has 4 waist decreases…you’ll want to do your decreases 1.5″ apart. You can also look at the waist measurement and decide if you want to do more or less decreases. Is the waist measurement smaller than you’d like? Skip a decrease. Too big? Do an extra decrease! Make sure you don’t begin your decreases until you’ve knit far enough to reach your full bust. You don’t want to start getting rid of stitches (and inches) before the fullest part of your bust. If the pattern says to start the waist decreases after you’ve knit an inch from the sleeve split, but your full bust isn’t until 2 inches past…wait until 2 inches. To try your sweater on, either put it on 2 really long circular needles or thread a piece of waste yarn through all of your stitches and pull your needle out. If you use 2 circular needles make sure that the total circumference will be able to fit over your shoulders…you don’t want to drop stitches while trying on your sweater! Trust me, it’s not fun to have to pick them back up. After your waist decreases you want to knit straight for a couple of inches to where your waist starts increasing to your hips. For the hip increases, use the same method as for figuring out the waist decreases. Your waist decreases and hip increases may not be spaced out the same depending on your body type. For example, I typically spread out my decreases farther than patterns call for, but put my hip increases closer together. Measure on your body where you’d like your increases to start and end. Divide this number by the number of increases you want to do to figure out how many inches apart to place them. There is no reason you need to do the same number of waist decreases and hip increases (unless you need a certain number of stitches for a cable or lace pattern). Tailor it to your body measurements. For sweaters that don’t have any waist shaping, such as the Rocky Coast Cardigan or the Schoodic Cardigan, you’ll just need to worry about hem length and the sleeves. Hem Length: The beauty of a hand knit sweater is that you can make it as short or long as you’d like! Something to keep in mind: if you use wool, your sweater will likely grow a little bit. Err on the side of a little short (you can block it longer or add length later) instead of too long. Trying your sweater on is a great way to decide exactly when to bind-off! A few words about bust darts: I’m nowhere near as knowledgeable about bust darts as I am about many other aspects of sweater knitting. 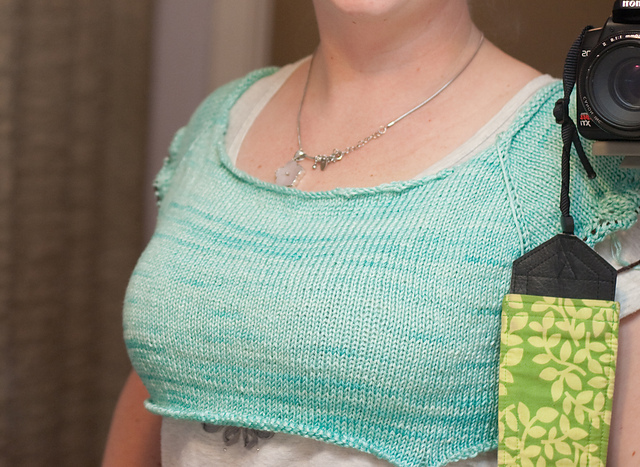 I’ve done horizontal bust darts in one knitted top so far, and it worked out beautifully. I’ll probably start doing them more often, but I can’t really give good instructions yet! If you have a cup-size larger than a C, it’s worth considering doing bust darts so that the front of your sweater doesn’t ride up. Horizontal bust darts give you a little extra room in the bust area without making the entire sweater larger. The bust darts are done by using short rows across the front of the sweater. 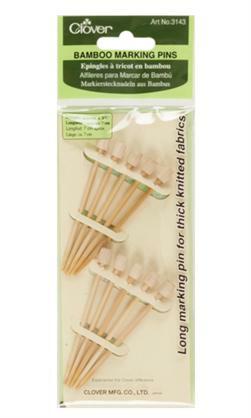 Custom Knits 2 (which we have at the shop) has a section on adding bust darts by using short rows. Little Red in the City (also at the shop! ), has a great section on shaping and horizontal bust darts. Ysolda tells you how to calculate how many short rows to do and gives tips on figuring out where to place them. Little Red is chock full of other great sweater-knitting information as well. Come on back on Friday for Tips and Tricks for Sleeves!